The Lion Storyteller Book of Parables is a beautifully illustrated hardback, featuring 15 of Jesus' parables. Perfect for bedtime reading with young children, or to read aloud in assemblies or children's ministry. Explore many of Jesus' best-known parables - like the Kind Stranger, the Lost Coin, and the Wise and Foolish Builders - with stories collected from the Lion Storyteller Bible as well as brand new re-tellings. Written in Bob Hartman's clear and accessible style, the stories are given a lively and engaging twist, allowing children to hear and understand the profound words of Jesus. It's ideal for primary school-aged children. The Lion Storyteller Book of Parables features warm and inviting illustrations by Hungarian artist Krisztina Kallai Nagy. This book would also be great for children who are beginning to read independently. Bob Hartman is the author of many Bible books for children and an authority on stories and storytelling. His interactive storytelling performances have been entertaining audiences around the world for over 15 years. The Lion Storyteller Book of Parables by Bob Hartman was published by Lion Hudson Plc in March 2016 and is our 2246th best seller. The ISBN for The Lion Storyteller Book of Parables is 9780745964461. Be the first to review The Lion Storyteller Book of Parables! Got a question? No problem! 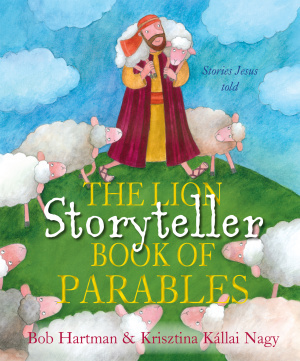 Just click here to ask us about The Lion Storyteller Book of Parables.